Max. performance: up to 120 KV/4 mA / max 240 Watt. Center grounded oil cooled glass X-ray tube with 1 x 1 mm focal spot and inherent filtration 1 mm Be. Can be delivered with different kinds of collimator systems, such as pencil beam or fan-beam geometry. 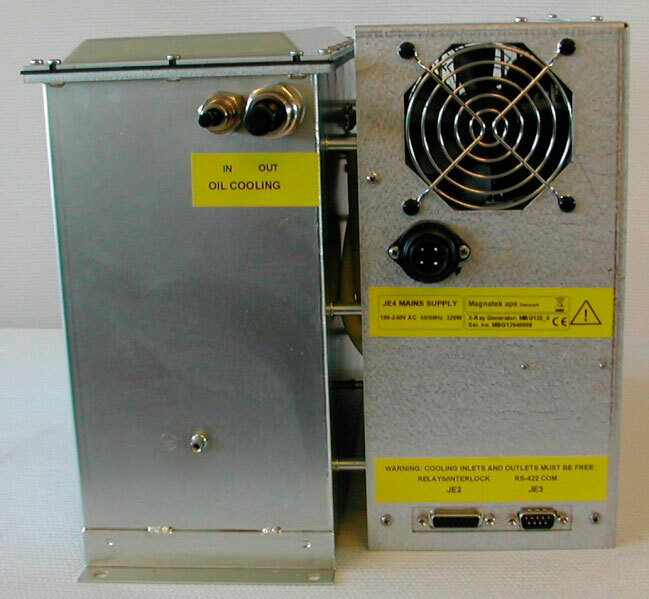 Complete X-ray source integrated into two blocks with control, HT generation in one and X-ray tube in the other. Versatile mains input, microprocessor control with RS422 serial interface, interlocks and warning lamps output. The whole housing is internally shielded with Pb. The MBG120 X-ray source is typical used for integration in high performance industrial measuring and material analysis systems.